Bicycle links are a very popular choice for jewelry, particularly for bracelets. They're more elaborate than regular links, and because they're made that way, the jewelry worker doesn't have to work further to make something great out of the metal when they have something like it in mind. This bicycle link bracelet is made out of stainless steel, measures at 8.75 inches, and ends with a simple fold over clasp for easy on and off. Part of the bicycle links are IP black plated to give it a little bit of color and a different look so it's not quite all the same, and the metal is high polished so that it shines and looks great. This stainless steel motorcycle chain bracelet is a great for the motorcycle enthusiast. Black IP-plated details stand out among the high polished stainless steel base. Bracelet measures 8.75 inches in length and 10mm (3/8"). 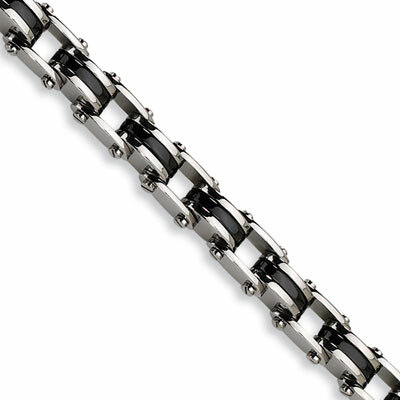 We guarantee our Men's Black Stainless Steel Bicycle Link Bracelet to be high quality, authentic jewelry, as described above.